Most base station antennas are omnidirectional in the horizontal plane (azimuth) so that mobile and portable radios may communicate with a base station from any direction. To increase the transmitter and receiver directivity, many base stations use collinear arrays of dipoles for up to 6-decibel gain at VHF stations and up to 12-decibel gain for UHF stations. The simplest mobile antenna is a quarter wave whip antenna. It consists of a single vertical element, approximately 1/4 wavelength long, mounted onto the metal roof of an automobile, and is called a monopole. The roof acts as a “ground plane” reflector so that the antenna radiation pattern emulates a dipole antenna. At VHF low band (50 MHz), a quarter wave monopole antennas are about 5 feet long. 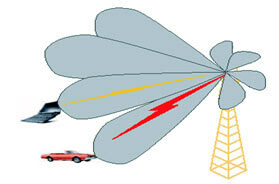 As the frequency is increased, the length of a monopole antenna is reduced. At 850 MHz, a monopole is only 3.5 inches long. 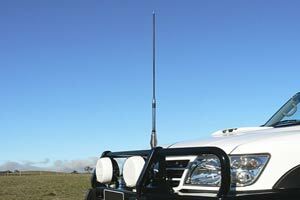 Portable radios usually use helically wound or rod antennas attached to the radio. These are usually less efficient than base or mobile antennas. There are also times when your body is between the portable and the base with which it is communicating, causing a decrease in signal. 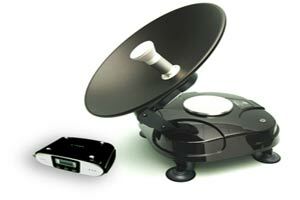 In addition, the height of the portable antenna (belt mounted versus a lapel-mounted speaker microphone antenna) can make a significant difference in radio coverage. A major development has occurred in the design of "smart antenna arrays" which are able to adjust to their environment so that they enhance desired received signals while discriminating against interference from undesired signals. 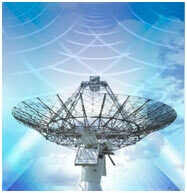 The antennas are made of a large number of antenna elements each of which are controlled using computer technology in near real time. The main lobes of the antenna are placed directly on the desired signals while nulls are placed at the angle of interfering signals. Each element of the antenna is "tuned" so the composite beam is adjusted to maximize desired signals and minimize undesired interfering signals. Our human ears work in a similar way at a noisy party. Even though there are several conversations occurring simultaneously, we are able to distinguish between them and focus on only one. Smart antennas our human ears work in a similar way at a noisy party. Even though there are several conversations occurring simultaneously, we are able to distinguish between them and focus on only one. Usually we do this by turning towards the desired conversation and concentrating our listening efforts toward the mouth of the desired speaker while “tuning out” the other undesired conversations.